This Greek Style Garlicky Shrimp with Feta is incredibly delicious and the recipe is easy. 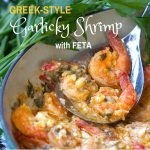 A steaming pot of shrimp in spicy, lemony, buttery garlic sauce with melted feta that’s ready in 35 minutes. Serve it with crusty bread to sop up every delicious drop of amazing sauce. I can’t rave enough about this recipe. It’s a treasure. 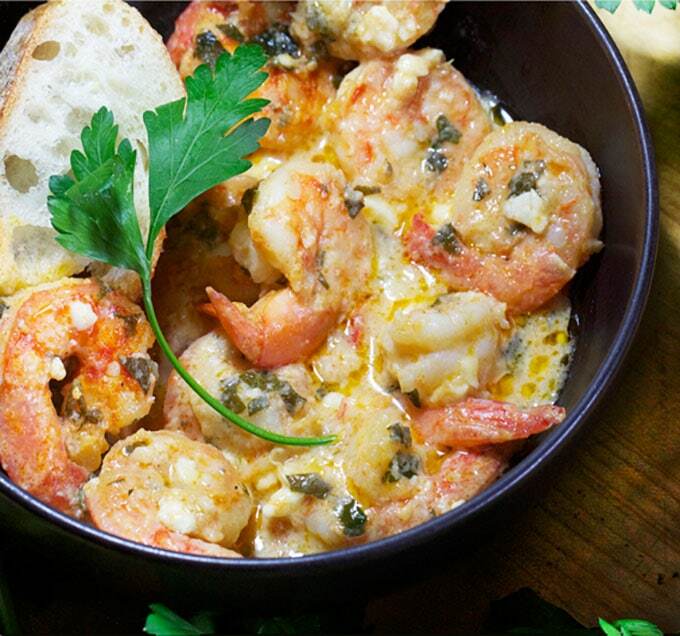 Perfectly cooked shrimp simmered in lemony, garlicky melted feta sauce. Truly outstanding! And it practically cooks itself. All you do is scatter a bunch of stuff in a pot, put the cover on, turn on the heat, and the magic happens. 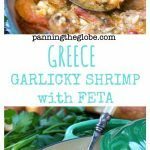 Gather all of your ingredients together: Shrimp, butter, oil, garlic, parsley, lemon juice, chili powder, salt and feta cheese. You’ll need a heavy casserole dish or shallow pot with a lid. Cut the butter and sprinkle it over the bottom of the pot. Lay half the shrimp over the butter. Next scatter on half the garlic, parsley and chili powder. Then add the rest of the shrimp, followed by the rest of the garlic, parsley and chili powder. Season with salt and drizzle with olive oil. Cover the pot and simmer for 8 minutes. Uncover the pot and add the lemon juice and feta cheese. Cover and cook for another 8 minutes, until the shrimp is just cooked through and the cheese is melted. Inside the steamy chamber the flavors meld and everything gets warm and tender. 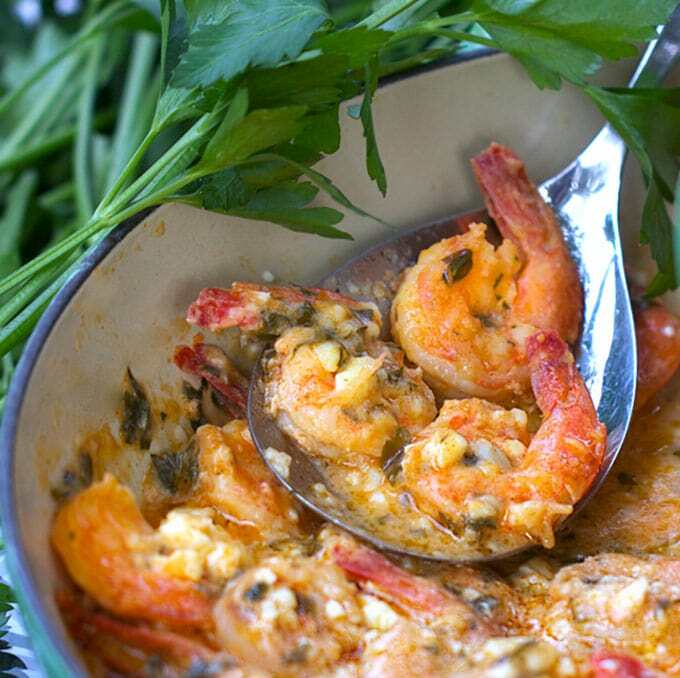 When you take off the cover an intoxicating aroma is unleashed and the sight of steamy fresh shrimp, floating in a lemony, garlicky sauce with melted feta on top is truly irresistible.
. She uses a fiery hot South African red chili pepper called peri-peri in her version. 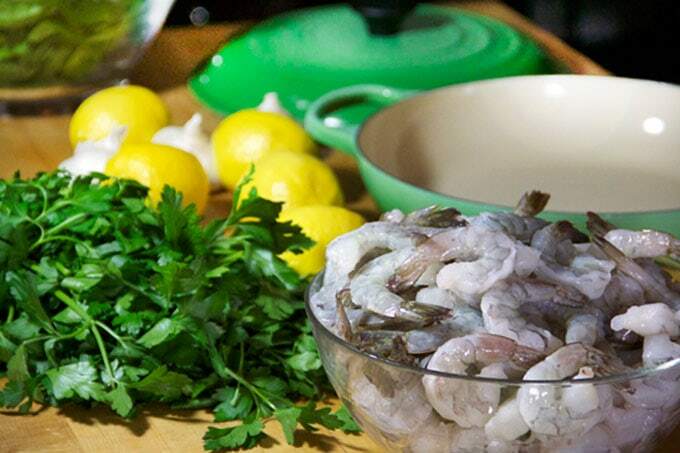 Serve Greek Style Garlicky Shrimp for dinner with a simple green salad and crusty bread. This dish also works really well over pasta. There’s plenty of delicious sauce to coat the noodles. My favorite way to serve this dish is at the start of a party, as an appetizer. I take the pot right from the stove, steaming hot, and set it on my kitchen island. I have a basket of sliced crusty bread nearby, a stack of bowls, spoons and forks. It’s also good to have napkins on hand in case people want to pick up the shrimp by the tails. When guests arrive, I take off the lid and let people dig in. Pure heaven! It’s great to have some recipes like this in the repertoire. So great when you don’t have to work very hard and you can still get something incredibly delicious on the table fast. This garlicky shrimp recipe gives way more than it takes. Speaking of easy and delicious, check out this easy potato latke recipe. 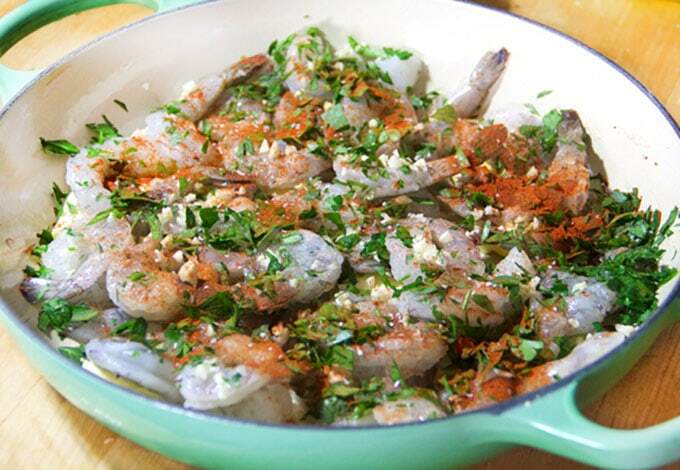 Here’s the recipe for Greek-Style Garlicky Shrimp with Feta. If you try this recipe I hope you’ll come back to leave a rating and a comment. I’d love to know what you think. 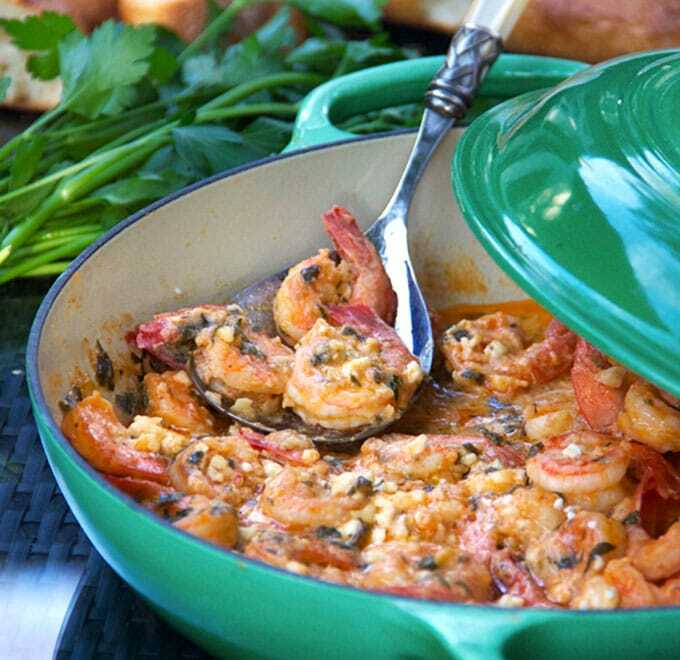 Garlicky shrimp with lemon, parsley and feta. A quick and easy recipe that’s delicious enough for a special occasion and easy enough for a weeknight. You’ll need a shallow heavy pot or Dutch oven with a lid. Chop butter into pieces and scatter around the bottom of the pot. Scatter half the shrimp over the butter. Scatter half the garlic, half the parsley, half the chili powder and half the salt over the shrimp. Drizzle on 2 tablespoons of olive oil. Arrange the rest of the shrimp on top, followed by the rest of the garlic, parsley, chili powder and salt. Drizzle on the remaining 2 tablespoons of olive oil. Cover the pot and turn the heat to medium high. Cook for 8 minutes or until the shrimp have lost their raw color. Pour in lemon juice and scatter the feta cheese on top. Baste the shrimp with a few spoons of sauce from the bottom of the pot, and gently jiggle the pot to distribute the sauce throughout. Lower the heat to medium-low, cover and cook for another 8 minutes or until the feta is just melted. Serve hot with crusty bread for dipping. Disclaimer: On occasion I provide links in my posts to cookbooks or other products, available for purchase on Amazon. If you purchase a product through these links, I receive a small commission with no extra cost to you. The feta cheese works so great with this recipe. I love how everything comes together. Hi! I’ve been really wanting to try this recipe because it looks absolutely amazing, but I do not eat cheese. Is there any alternative you can recommend? Thanks so much! Feta is so integral to this dish that I can’t imagine without.